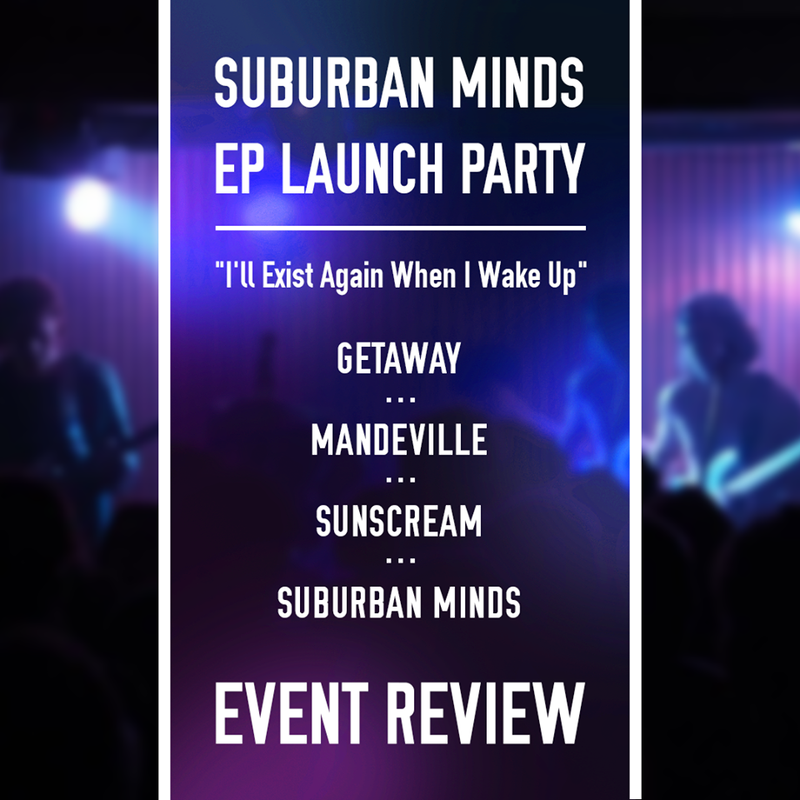 A great night of live music at The Hunter Club with stellar sets from headliners Suburban Minds, and from Sun Scream, Mandeville and The Getaway. The night kicked off with the indie funk of The Getaway. A real toe-tapping performance from such a great band, especially considering “their guitarist fucked off to France for the week”. The foursome cracked out some great tunes, notably the tracks Cigarette and Seeing Red, laden with groovy guitar riffs and incredible stage presence from their frontman. A great set to open the show with. Chelmsford garage rockers Mandeville were up next, and they were next level. It was their first time in Bury St Edmunds, and off the back of this performance, I’m hoping it won’t be the last. Their energetic set was a standout performance of the night, ‘High Roller’ a particular highlight out of a brilliant set of tracks straight off their latest EP Double Denim. Bury band Sun Scream warmed up the growing crowd with their superb psychedelic alternative rock. The five-piece band ploughed their way through several tracks, opening with the haunting Sun Scream and then the thumping She which is such a great song to hear live, easily one of the best tracks from any BSE band. They are most definitely a band to watch on the Bury music scene. And then the time came, the headline set from indie rockers Suburban Minds. Opening with the jingly White Things, the band already had the adoring crowd in the palm of their hands. The band rip-roared their way through some old favourites such as Leave It There and Car Seat, though their performance of Sunbreak will live long in the memory. Suburban Minds then went on to play the rest of their EP in full, with Addicted To A Daydream sounding so much better as a live track. It all got a bit too much for the lead vocalist, who went shirtless halfway through this track. It’s no wonder they are one of Bury’s most loved bands with their rousing choruses and insanely-catchy guitar riffs prevalent in the aforementioned track and in their EP closer Little Miss Modest, made even better with a great light show to accompany the music. The group then treated the audience to a Weezer mash-up of Say It Ain’t So and Beverly Hills, where the bass guitarist and lead guitarist decided to follow the frontman into going half-clothed. After going off stage after this track, the baying crowd wanted so much more from the band, who instantly came back on stage and performed breakthrough track I Wanna Feel, their first ever single which still sounds so fresh today. At the end of the hectic show, the band said that they were going away for a while, but this will most certainly not be the end for Suburban Minds, who after tonight cemented they are one of the best live bands in Bury St Edmunds.